Vacuum Chamber Design: What is a Virtual Leak? - Meyer Tool & Mfg. ﻿​Vacuum Chamber Design: What is a Virtual Leak? 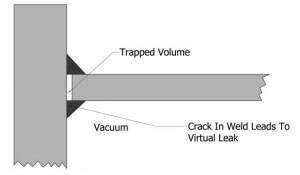 A virtual leak is a trapped volume of gas connected to the vacuum side of a chamber that can not be pumped out easily due to the restriction in the path connecting the trapped gas volume to the chamber volume. As the chamber pump down cycle crosses over from viscous to molecular flow, the gas molecules within the trapped volume can only be pumped out at a rate proportional to the conductance of the path between the trapped volume and the chamber volume. This rate is the “virtual leak”. 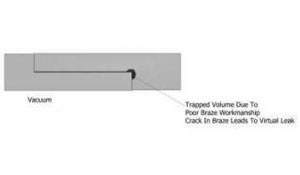 A virtual leak will not be detected in a normal helium leak testing cycle. The presence of a virtual leak will become apparent during the system pump down cycle if the vacuum pumps can not keep up with the gas load from the virtual leak and ultimate pressures can not be reached or take an excessive time to reach. 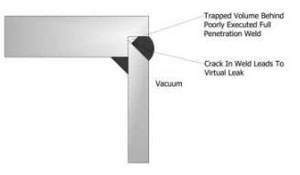 Poor design techniques or workmanship issues are the major cause of virtual leaks. They can also be caused by laminations in raw materials, but these are much rarer occurrences. 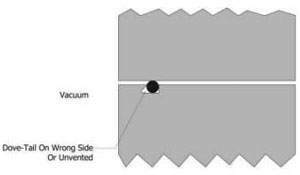 Trapped volumes caused by un-vented or poorly vented blind tapped holes within the vacuum volume. 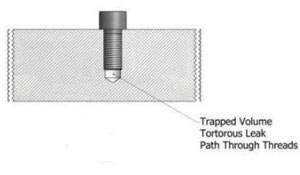 Trapped volume caused by incorrect weld design. Trapped volumes caused by unvented double o-ring seal designs. 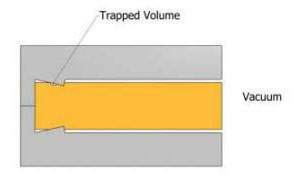 Trapped volumes caused by unvented single or double dovetail o-ring groove designs. 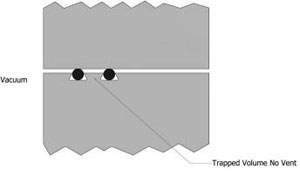 Trapped volumes caused by cracks in interior welds or braze joints. 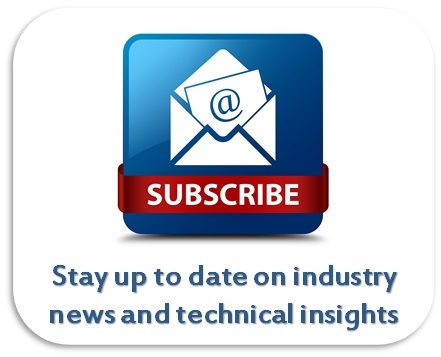 ​Virtual leaks are easily avoided if good vacuum practice is followed in the design and fabrication of your chamber. Future articles will discuss these practices.